Developed by popular demand, the Vielight Neuro Duo combines our transcranial intranasal devices – Neuro Alpha (10Hz) and Neuro Gamma (40Hz) – into a single attractive package without the full cost. 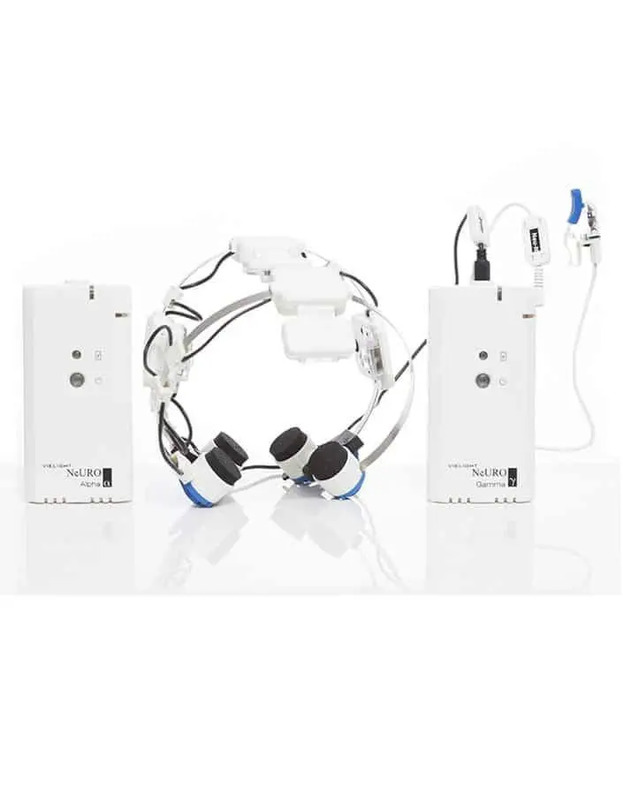 Users can now take advantage of the 10 Hz and 40 Hz pulsed photobiomodulation option with two separate control units, a common transcranial helmet and an intranasal applicator. Gamma for serious neurological conditions such as Alzheimer’s, Parkinson’s, mild cognitive impairment (especially when they say they are starting to be forgetful), dementia from concussion (CTE) and ADHD. ⏱️ Use once the gamma once daily for 6 days but do not use on the 7th day. Then repeat cycle. Designed primarily for domestic use, the Neuro Duo is powerful, portable, dual-voltage and rechargeable. the Alpha and the Gamma. Both are classified as General Wellness devices, not medical devices.